Secretary of State Mike Pompeo arrived Tuesday morning in Saudi Arabia amid expectations that the oil-rich, ultra-conservative Islamic kingdom was about to present its version of events surrounding the disappearance and alleged murder of journalist Jamal Khashoggi. Pompeo was dispatched on Monday, immediately after President Donald Trump had a phone call with the Saudi king, whom he said denied any knowledge of Khashoggi's fate. Speaking to journalists after that phone call, Mr. Trump offered a possible explanation to counter Turkish officials' assertion that a team of 15 Saudi operatives arrived at their consulate in Istanbul on Oct. 2 and killed and dismembered the Saudi writer. It could have been "rogue killers," Mr. Trump suggested. But after two weeks of flat denials from the Saudi regime of any role in Khashoggi's disappearance -- continuing, apparently, right up to Mr. Trump's phone conversation with King Salman, two sources close to the kingdom confirmed to CBS News later on Monday that the Saudi government was planning to admit he was killed, but call it an accident. The officials told CBS News reporter Kylie Atwood that the Saudi government was expected to claim a mission was approved by King Salman's son, Crown Prince Mohammed bin Salman (often referred to as MBS), to interrogate Khashoggi, but not kill him. They will say, according to Atwood's sources, that the journalist died as the result of an interrogation by Saudi operatives that went wrong. A third source, also close to the Saudi government, told CBS News that the Saudis would claim the operation was planned and executed by a general close to the crown prince, and that MBS never authorized Khashoggi's murder. The source said the Saudi statement, to be released via a joint investigation being carried out by Turkey and Saudi Arabia, will make it clear that the general exceeded his authority and will be held accountable. Khashoggi, once a trusted media adviser to the Saudi royal family which has ruled over the oil-rich kingdom for hundreds of years, fell out of favor with the royal court beginning with the unrest of the 2011 Arab Spring uprisings. He went on to write articles critical of the royal family, and Crown Prince Mohammed bin Salman in particular. As MBS rose in prominence over the course of the last five years, Khashoggi fled into exile in the U.S. and continued penning articles critical of the royal family. On Oct. 2, he visited the Saudi consulate in Istanbul, hoping to secure paperwork for his planned marriage, but his wife said he never walked back out to meet her where she was waiting. The Saudis, for two weeks, denied that he vanished inside their consulate, calling accusations that he was killed there, "lies and baseless allegations." But they have yet to provide any evidence to back their initial claims that he walked back out of the building, or anything to show what happened while he was inside. Turkish officials have said, meanwhile, that they have audio and possibly even video evidence proving Khashoggi was killed there. Details leaked to U.S. news organizations from the Turks include an allegation that one of the individuals identified among the 15 Saudis who came to Istanbul on private jets on Oct. 2 was an expert in autopsies, who brought with him a bone saw. Mr. Trump said he sent Pompeo to Saudi Arabia to get answers from the Saudi royals. 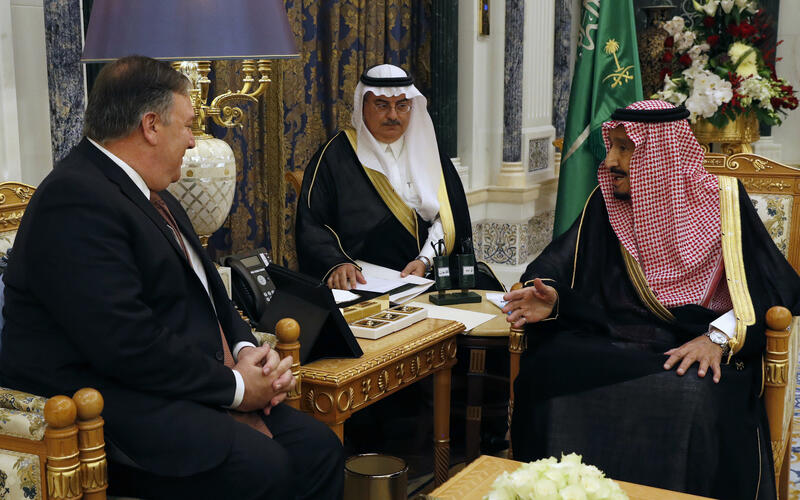 Pompeo met King Salman and Foreign Minister Adel al Jubeir soon after his arrival and later sat down for talks with the crown prince. Before the door was closed to the press, MBS told Pompeo that Saudi Arabia and the U.S. were, "strong and old allies. We face our challenges together -- the past, the day of, tomorrow." After his meetings with the king and foreign minister, Pompeo's staff in Washington released officials readouts saying he had, "thanked the King for Saudi Arabia's strong partnership with the United States," and for "his commitment to supporting a thorough, transparent, and timely investigation of Jamal Khashoggi's disappearance." State Department spokesperson Heather Nauert said Pompeo had, "reiterated U.S. concern" over Khashoggi's disappearance in his chat with Saudi Foreign Minister Ahmed al-Jubeir, and that the two men "agreed on the importance of a thorough, transparent, and timely investigation." The Saudis are the biggest buyers of U.S. military hardware in the world. Mr. Trump has made it clear he's reluctant to cancel a planned arms sale to the kingdom worth $110 billion, but he vowed "severe punishment" if the Saudi regime is found to bear culpability for Khashoggi's presumed killing. On Monday, Turkish investigators were finally allowed by the Saudis to carry out an inspection of the consulate -- again, part of the official joint investigation the Turks agreed to over the weekend. They were accompanied by Saudi officials. Turkish President Recip Tayyip Erdogan was quoted on Tuesday by his nation's press as saying the investigators had searched for traces of "toxic materials" inside the consulate. The top Saudi diplomat's residence in Istanbul was also searched on Tuesday, according to Turkey's Foreign Ministry. Turkish police said Saudi Arabia's Consul General Mohammad al-Otaibi left the kingdom on Tuesday as his home was searched. Fran Townsend: Changing story on Khashoggi "belies the credibility of the Saudis"
Regardless of the story the Saudis eventually present to the world to explain Khashoggi's disappearance, several questions may continue to dog the kingdom, the most crucial of which will be the plausibility of the explanation itself. The royal family enjoys complete control over every single aspect of policy in the kingdom. It has final say on any and all actions taken by its representatives. And details -- if they can be proven -- like an autopsy expert identified by name, stepping off a private jet from Saudi Arabia, carrying a bone saw to perform an "interrogation," may prove hard to explain away. CBS News correspondent Holly Williams, in Istanbul, says another question is how much damage the entire episode will do to Saudi Arabia, which remains a key U.S. ally in the tumultuous Middle East. The Saudis' bitter rivals in Iran -- a nation the Trump administration is keen to contain -- would seize quickly on any perceived divisions between Washington and Riyadh to try to increase their regional influence. The crown prince has portrayed himself as a reformer, winning praise for finally allowing women to drive and taking other steps aimed at reshaping the strict Islamic state's public image. But in disgust over Khashoggi's still unexplained disappearance, some business leaders have already pulled out of an investment conference in Saudi Arabia this week, and sanctions are being discussed in Washington -- not just by the White House, but by Congress, which has significant power to act independently. Meanwhile, one current and one former U.S. official told CBS News on Tuesday that Saudi Arabia's ambassador to the U.S., the crown prince's younger brother Prince Khalid bin Salman, left Washington last week without stating a reason and returned to Riyadh. There are conflicting reports about his plans following meetings in Riyadh this week, but State Department officials say their understanding is that he will be returning to Washington. Prince Khalid was among the Saudi officials who greeted Pompeo off the plane in Riyadh on Tuesday, according to a preliminary list provided to U.S. media and multiple Arabic media reports. Editor's note: This story has been updated to reflect that the Saudi ambassador to the U.S. is expected to return to Washington. An earlier version said that he was not expected to return.